DETAILS: This spectacular Gulf front condo with heart-stopping views makes an unforgettable vacation location! With its spacious rooms and magnificent views, this incredible 3 bedroom plus bonus room and 3.5 bath beach condo along scenic 30A will not disappoint! When entering the home on the first floor, you will walk up the steps until you reach the third floor. There you will be welcomed by a large living and dining area that connects to a balcony. 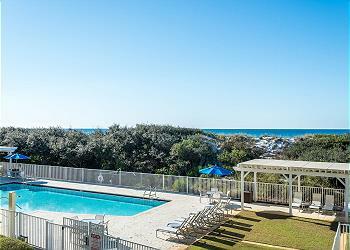 What a fabulous place to take in the beautiful panoramic views of the Gulf of Mexico! Continuing on the third floor, you will discover a fantastic kitchen! Here, you can utilize high end appliances, granite counter tops, and stunning cabinetry. Completing the third floor is the master bedroom with a king bed, flat screen television, a DVD player, and a connecting bathroom with a double vanity, jetted tub, and a glass shower. This room also has amazing ocean views. Additionally, there is a king bedroom with a flat screen television and a connecting bathroom with a single vanity and a glass shower. There is also a bonus room on this floor that has a Trundle Daybed and a flat screen television. Next to that, you will find a second living area, giving you a vision of paradise! Lastly, on the fourth floor, you will encounter a queen bedroom with a flat screen television, a DVD player, and a connecting bathroom with a single vanity a tub and a walk-in shower. Here you can find another balcony with picture-perfect views! Start your mornings off by relaxing with a cup of coffee on either of the balconies to capture that eye-catching view of the emerald coast or end your evenings with a picturesque sunset. This condo has an abundance of indoor and outdoor space, which truly is a great gathering spot for everyone to spend time together. Do not forget about the private pool at the 1848 building! This pool will be available for you to access during your stay! This marvelous 30A condo is simply stunning and gives you the serenity you have been craving and it is all here at one of the most beautiful beaches in the world! This home provides parking for two vehicles. We are so happy you enjoyed your stay in Watercolor! Thank you for choosing to stay with 360 Blue and we can't wait to have you back at the beach again soon! The condo was absolutely amazing. Very clean and comfortable. Given that it is a 3rd floor condo I really wish guests had access to the elevator. It appeared to work but the door was locked shut. My mother in law had difficulty with the stairs. I would definitely come back. We are so delighted that you enjoyed your vacation with us in Watercolor! We especially loved the photo you shared with us! We do apologize about the elevator and we will be sure to share this valuable feedback with the HOA in regards to this. We look forward to seeing you again soon! This property is even more gorgeous than the photos with the perfect view of the ocean! When we arrived, the view from every room took my breath away! The decor and finishings are the perfect balance of cozy and high-end elegance. Walking distance to a Seaside, parks, pools and restaurants. Close by, spacious parking spot. Only downfall is no elevator access but the stairs are inside the residence and beautifully decorated and allow for downstairs landing to leave sandy beach items, shoes, etc. so really only was inconvenient upon arrival with our luggage. We would definitely stay here again! We are so glad that you enjoyed your vacation with us in Watercolor! We agree that the view and accommodations of these condos are second to none, not to mention the location! Perfectly placed to enjoy all that the area has to offer! We look forward to seeing you all again very soon!